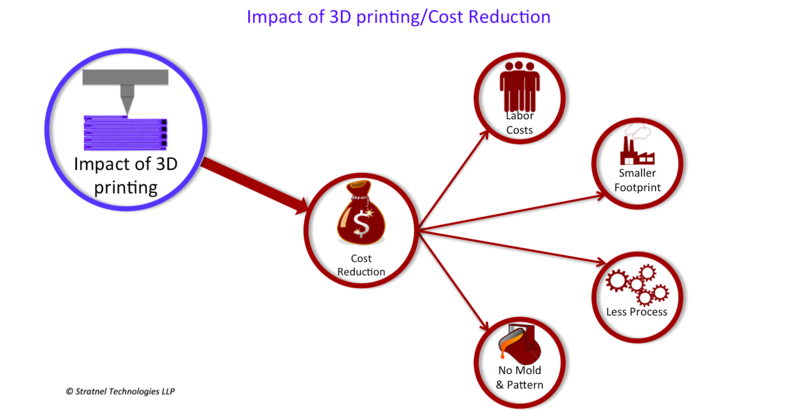 Additive manufacturing helps in cost reduction of various factors of production. This is achieved by several factors including labour, the number of process steps, factory footprint and not requiring molds and patterns. Apart from reducing the cost of the factors of production, 3D printing can also help in other ways. Reducing the weight of the end product is one advantage. Weight saving is a big advantage in products used in aerospace and robotics. Every once of weight saved by an airplane helps in reducing energy costs. There are similar gains in robotics. Reducing the weight of end of arm fixtures (EOAF) improves the load bearing capacity of the robotic arm. Many other industries have found similar advantages. Medical applications, dentistry, prosthetics, sports and several other industries have adopted 3D printing. This is not just because of technological advantages. Cost reduction has played a significant part in these decisions too. What is now a niche industry is bound to find mass adoption and will become the most dominant method in the future. One of the significant factors that drives these changes will be the cost of production. Additive manufacturing helps to reduce labor costs. These savings arise from lesser operator oversight since the process is completely automated. Additive manufacturing will require less number of machining steps. This helps in the reduction of overall cycle time. Factory footprint is often overlooked while evaluating cost of production. It is an important factor. Additive manufacturing helps to reduce factory footprint by reducing number of process steps. This is one of the greatest benefits of additive manufacturing. Molds and patterns not only cost a lot of money but also involve high lead times. Additive manufacturing helps to do away with these expensive tooling.